2004 release. 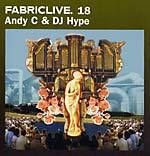 FabricLive. 18 sees two of the most exciting talents showcase their sounds together for the first time. Kicking off with DJ Hype; we journey through up-to-the-minute cuts, exclusive forthcoming tracks from his Ganja label and his special edits of Benny Blanco and JB. Andy C takes over for the final part, showcasing his superb technical skills as he furiously mixes up tracks by J Majik, Moving Fusion, Ed Rush & Optical, DJ Fresh, and his own Ram Trilogy moniker. Other artists include: The Militia (DJ Friction & K-Tee), Future Prophecies, D-Type, A Sides (feat. MC Fats), Wickerman, Shimon, Potential Bad Boy (feat. Spikey T), Krust, Fierce, DJ Fresh, Zen, Baron, Top Buzz, Phantasy & Shodan, Decorum, and Weapon.